My brother's plan to have the "Grand Opening" show-off of our remodelled and beautified parents' house fell through. He called me at work Monday to tell me that he discovered some damage in the new carpet that carpet installers had come to install and there would be no replacement carpet available until December. Besides, the outside of the house hasn't been painted yet, so the house is not ready. I was having a terrible day at work and frankly, had so much to do that day and the next that I couldn't see how I'd be able to leave right after work the next day, anyway, which had been my plan. If I get to leave right at four, I will reach my destination in Sonoma County by midnight, but if I leave work at six or seven P.M., it's crazy to drive all night. So if we had no official "festivities" until Thursday, I decided to not push myself to leave Tuesday night, but work as late as necessary in order to get things done by their deadlines. I ended up working to 6 P.M. both days. One of my co-workers has a good friend who is good friends with the wife of actor Patrick Swayze. Patrick Swayze's wife is also an actor, or at least a dancer (Patrick met her due to her being a student at his mother's dance academy in New York--thus because of this famous dance-teacher-mother, you can get an idea why "Dirty-dancing" Patrick became a dancer, himself! ), but I just don't know her name. So this makes my co-worker a friend of Patrick's wife via one-degree of separation. Sometimes a new establishment of some kind will publicize their existence by throwing a party for celebrities and then the word, cache', and coolness factor spreads. For example, when Mammoth Mountain, the large Southern California ski resort, opened in the early 70s, the resort threw a huge celebrity ski weekend, inviting a large list of celebrities who, in turn, were asked to invite their publicists for a multi-day skiing bash. Actor Robert Stack and his wife Rosemary were among the celebrity celebrants, and the Stacks invited their good friend, my uncle (the one who was the celebrity photographer), to come take pictures of them, and my uncle, in turn, invited my sister the ski freak (not the one who is having us for Thanksgiving tomorrow). Well, some new hotel is opening in Las Vegas and the hotel was throwing a celebrity opener to which the Swayzes were invited, and Patrick's wife invited her friend and my co-worker. My co-worker is one who rarely takes a vacation, but this four-day Las Vegas trip with the Swayzes was too good to pass up. They were going to fly to Las Vegas in the Swayze's private jet, ride a limousine all around Las Vegas, and yack it up in this new hotel (my co-worker loves to gamble, so this whole thing really was right up her alley). When she got back (Tuesday), the one thing I wanted to hear about was the private jet. My co-worker did not know what kind it was, but from her description I guessed it was bigger than a Lear Jet, for example. She said it seated more than four people. But to me the VERY COOL thing was that she told me that both Patrick and his wife are pilots. Patrick flew the plane to Las Vegas, and his wife flew it back home to the Van Nuys airport! I don't know why that excited me so much, but I thought that was so great that I wasn't even envious of them; instead, I was just filled with admiration. 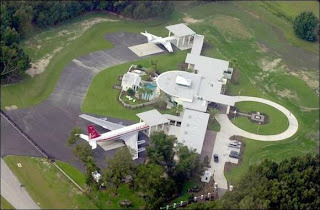 Now I know that other "Hollywood types" are also pilots and some are very accomplished, such as John Travolta, who has a couple of huge jets that he parks next to his house in Florida. Tom Cruise is another accomplished pilot who owns several planes, including a serious acrobatic plane in which Tom loves to fly loop-the-loops, upside down, and other acrobatic tricks (SCARES his companions who come along for the ride!). I think Harrison Ford owns planes that he flies, also, but I'm not 100% sure about him. As fate would have it, one of my projects that took me up to 6 PM to finish required mailing out that night, so I took the envelopes to the Van Nuys post office on Sherman Way, because it will accept mail up to 8 PM. That post office happens to be quite near one of my favorite restaurants, 94th Aero Squadron, which is right next to the Van Nuys airport and you can watch planes taking off and landing right outside your window as you eat. So, since I was in the neighborhood, and in honor of the two Swayze pilots, I decided to have dinner there and sort of "dream" about the planes. The dinner was great and afterwards, I went out to their patio and stood by the chainlink fence and watched several executive jets, some taking off, others coming in to land, two helicopters take off, and one single-engine prop Cessna take off. Each type has its distinctive engine sound, the jet's shriek, the helicopter's stacatto, and the Cessna's roar, but all of them are exciting. I was impressed at how many people were perfectly secure flying late at night, but I guess if they know what they are doing, the darkness doesn't matter. I wonder how hard it would be, how long it would take, how much it would cost to learn how to pilot a jet? One thing for sure, I think that would be quite a thrill. Oh well, as for me, I better finish learning how to sail, first! That is much more practical and useful for now. I left bright and early this morning and did not encounter heavy traffic, which was a pleasant surprise. The car was smooth, fast, and beautiful, and I filled "the cabin" with gorgeous sounds from my iPod piped through the car's stereo system. I did not leave L.A. with a full tank, reasoning that I might just encounter lower gasoline prices outside of the city, which sometimes does happen. However, that did not happen this time. When I needed to fill my tank, I went to a brand-new Union 76 station and then had trouble getting the pump to work. I'd slide the credit card in and put the nozzle into my gas tank and the pump would shut off before dispensing a drop and nothing I could do would make it work. So I cancelled the transaction, tried the whole thing again, and the same malfunction repeated. I went into the station to get help from the manager, who came back outside with me to see what was going on. He couldn't get the pump to work, either, so I suggested that perhaps I should move forward to the pump just ahead of me that was now vacant. "Oh no, I don't think you want to get gas from there," he cautioned, "that's racing gasoline and costs $7.00 a gallon." "Racing gasoline," I asked, "what's that?" I had never heard of this, but it is 100 octane gasoline for high performance engines such as Ferraris and Lamborghinis. Honestly, I had never known there was such a thing, or that they required special gasoline, and to think I'd first see it practically way out in the middle of nowhere on I-5. So instead I went to yet another pump and the manager determined that for some reason, none of them were going to work with my card, but that I had to go inside the station, instead, and run the card through there. And yikes, this place cost me $50.00 to fill my tank, that was the highest I have paid in my whole life, and I only had 91 octane Super! I got to the motel in Palo Alto (where I had decided to stay tonight) in record speed, I felt. Tomorrow I will then drive the rest of the way to Clear Lake for Thanksgiving. I checked into my motel (where I am now, writing this on their free wireless network in the room, something I HAVE to have now wherever I stay), went shopping for some wine to bring my sister, and then went to dinner. My sister might think this is cute--I bought the wine at a liquor store where she had her first job. She worked there in their gift-wrapping department for the Christmas holidays when she was in high school. I hope her kids will think this is cute (and I hope that this isn't something that has been done before)--I bought "wine" for each of them, too, but their "wine" comes in perfect champagne-looking bottles (complete with cork that you have to pop) but is sparkling fruit juices, one is peach and the other is mandarin orange. The labels are painted with very beautiful "botanical" drawings of the fruit. After that, I went for a drive through my old neighborhood in Atherton, which was where we lived during most of my life. Yegads, the name of the game in Atherton is Silicon Valley millionaires and billionaires buying $2,000,000 to $3,000,000 houses, tearing them down, and building $6,000,000 to $8,000,000 (maybe more) houses. Our house was torn down a couple of years ago, and that house which is taking its place is only now nearing completion. I've gotten used to seeing all those immense monster houses peppered around in the neighborhood, by now, but it no longer feels like the neighborhood it was when we lived there, and I guess it isn't. These houses aren't just tall, such as what you get when you replace rambling one-story ranchers with houses that are three-stories high--these houses are rambling three story houses. I guess if I had that kind of money, I might want to live in something like that, too. But somehow, with me NOT having that kind of money, today I really felt as though something major had happened when I wasn't looking and the world split into two different dimensions, with me stuck down in the old, backward one and having no possible hope of ever being in the new, elevated, "rich" one (and being depressed with what is going on at work doesn't help). People flying their own jets, filling the tanks of their Ferraris with 100 octane $7.00 a gallon gasoline, and tearing down beautiful multi-million-dollar houses (that most people would view as their dream house) so that they can replace them with something with five or six times the square footage--I guess Mars attacked when I was asleep and our world was taken over by aliens. Aliens with a LOT of money (hauled in from some uninhabited "mining planet", rich with gold, diamonds, uranium, or whatever it is that is valuable to a Martian). Tomorrow I'm going to be thankful, but tonight, I'm just a little...sigh.